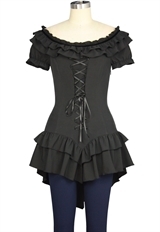 It's a Gothic shirt with double-layer ruffles in collar and bottom hem. Ribbons in front center. Side zip. Standard size approx. length: 38 inches; Plus size approx. 40 length: inches. Hello Helen, Sorry it's just a prototype. Thank you. Hi there, is this top going to be produced?